Yesterday, we learned reported that set up was going on for the first filming for Star Wars Episode VIII was going to take place today at Skellig Michael, off the coast of Ireland. Unfortunately, news is coming out of Ireland that the shoot has been cancelled for the day. Apparently the winds off the coast were too strong, leading to dangerous conditions for boating out to the island. 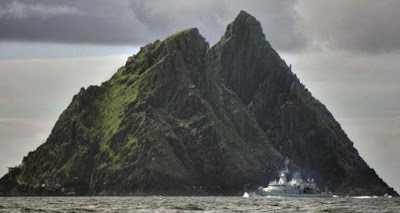 "High winds around Portmagee and Ballinskelligs saw filming of Star Wars: Episode VIII on the Unesco World heritage site of Skelllig Michael cancelled on Monday morning, with the small boats which service the site refusing to go to sea. Locals say the seas were too rough for the boats on Monday morning." The rain also lead to the cancellation of two days of the Listowel Harvest Festivl (in case you were planning to attend). No word yet on if the filming will be able to pick up tomorrow. Weather reports seems promising for the rest of the week, so hopefully the Episode VIII crew will be able to pick up the shoot later and won't be hindered too much. You should proof read your writing.